Climate Change and Drought Monitoring in Sri Lanka and Maldives. 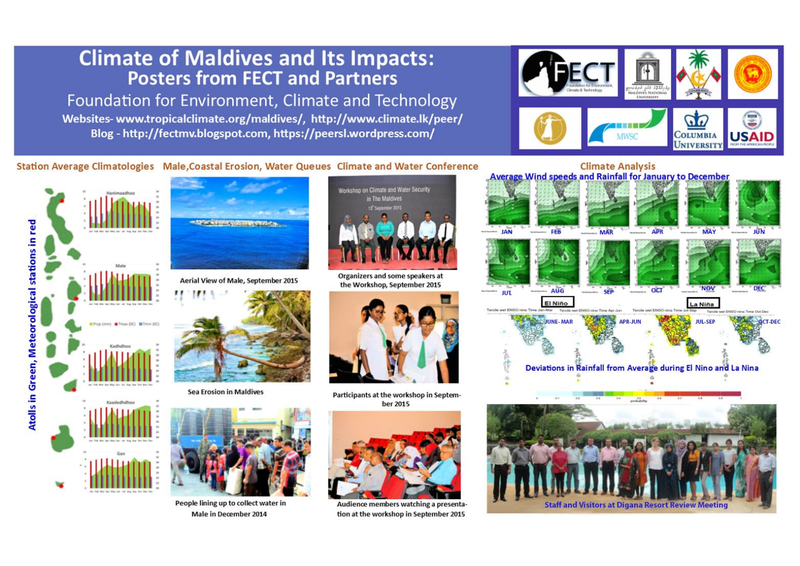 Summary- Scientists from the Foundation for Environment, Climate and Technology, Maldives National University, Columbia University are working with others in Universities, Water Supply and Meteorological Services to develop monitoring and predictive tools for drought risk and to address a riddle in climate change projections which predict a wetter climate although what has been experienced is sustained drying. This project is sponsored under the PEER program of the US National Academy of Sciences and USAID program in Sri Lanka and Maldives. 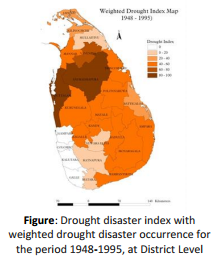 To develop operational state of the art drought assessments using climate information, and to assess the climate change impacts on drought risk in Sri Lanka and the Maldives more reliably in the next decades. Developing Drought hazard analysis and monitoring. Develop Assessment of near-term climate change . Undertake Drought and water scarcity projections for selected locations. 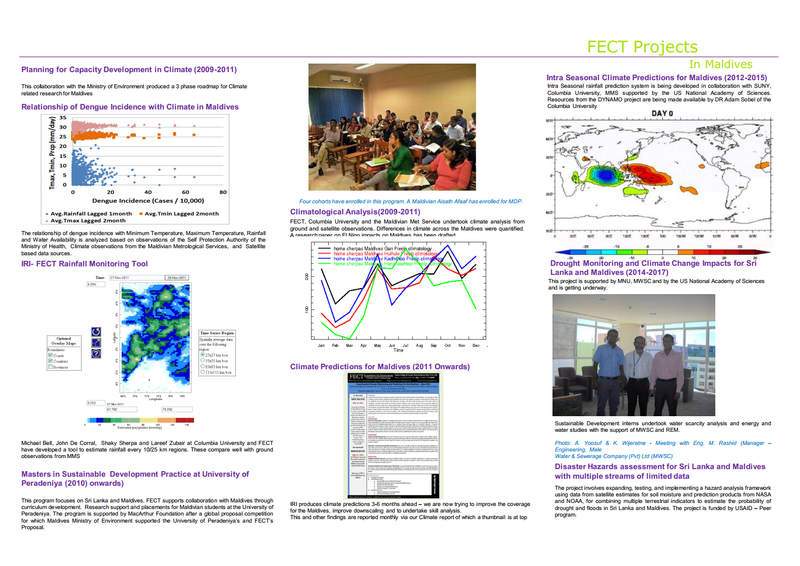 Improve hydro-climatic advisories prepared by FECT for Dissemination and outreach including analysis of climate information by disaster experts. Capacity building through improving research infrastructure and training for research students. Gains from improved water and drought risk management and policy making. Demonstration in generation and use of climate information for disaster risk management. The provision of near-term climate change projections. Development of expertise in application of drought and near-term climate change information. Training on interpretation for key experts and undergraduates. Developed tools for rainfall monitoring from Satellite data. Developed tools for drought monitoring. 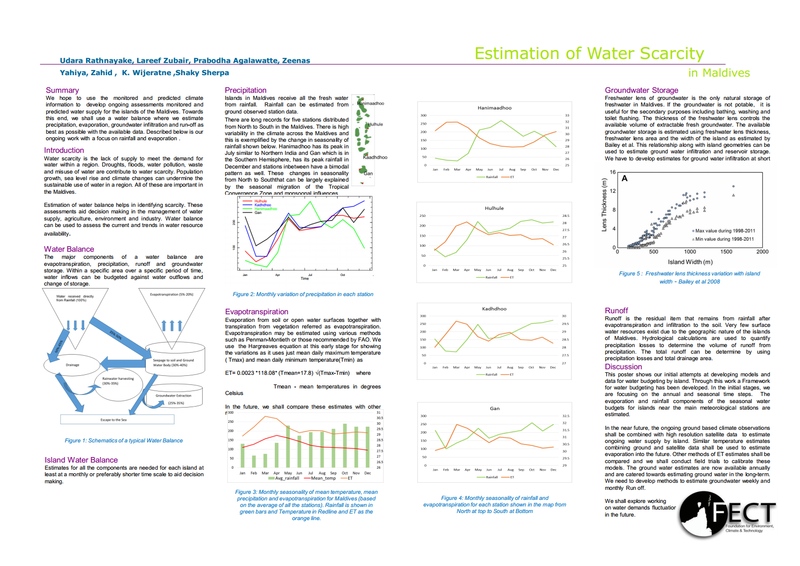 Estimating water scarcity in Greater Male’ Maldives. Data analysis on disasters in Sri Lanka. 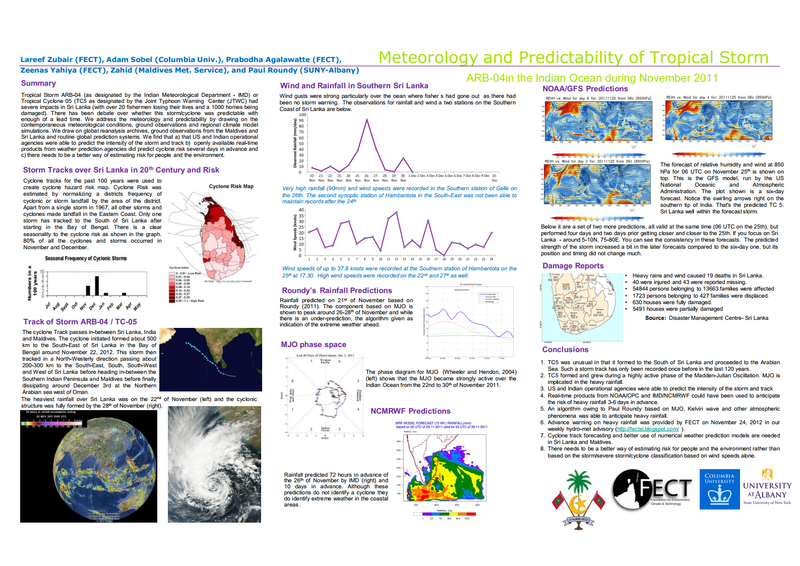 Seasonal climate reports for Sri Lanka. 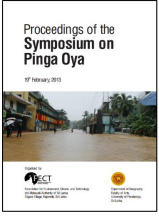 Pinga Oya floods & environment assessment. 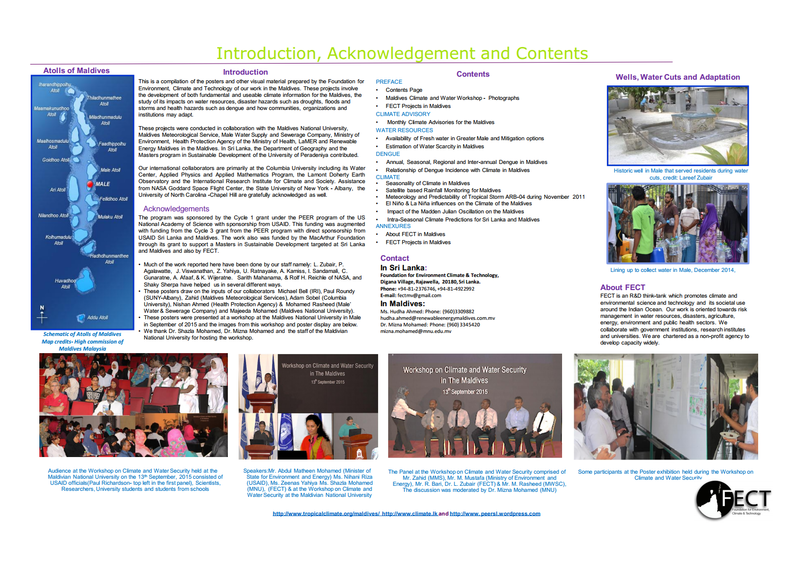 A poster book has been developed by FECT in regard to the projects being implemented in Maldives. 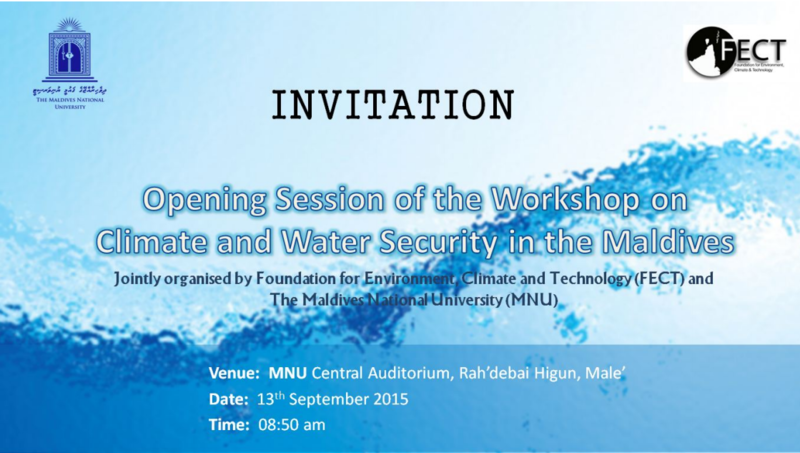 Workshop on climate and water security in the Maldives. Monthly climate advisories for the Maldives. 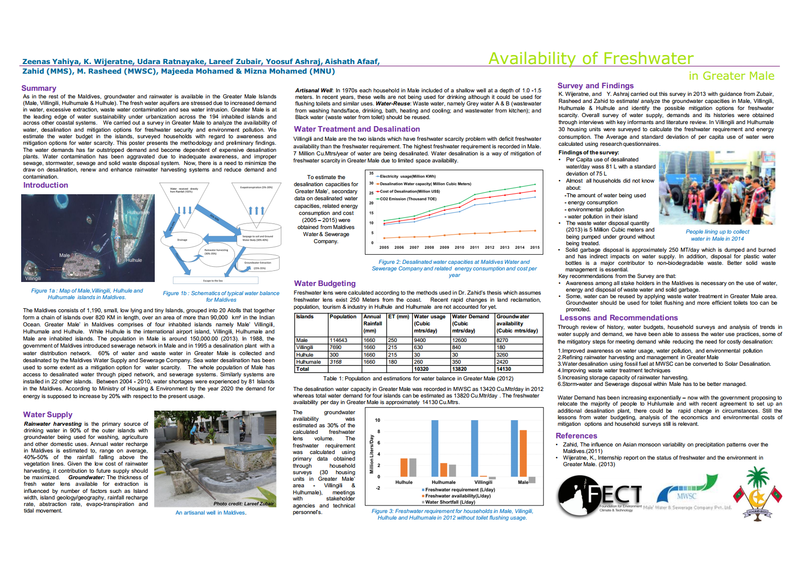 Availability of freshwater in greater Male. Estimation of water scarcity in Maldives. 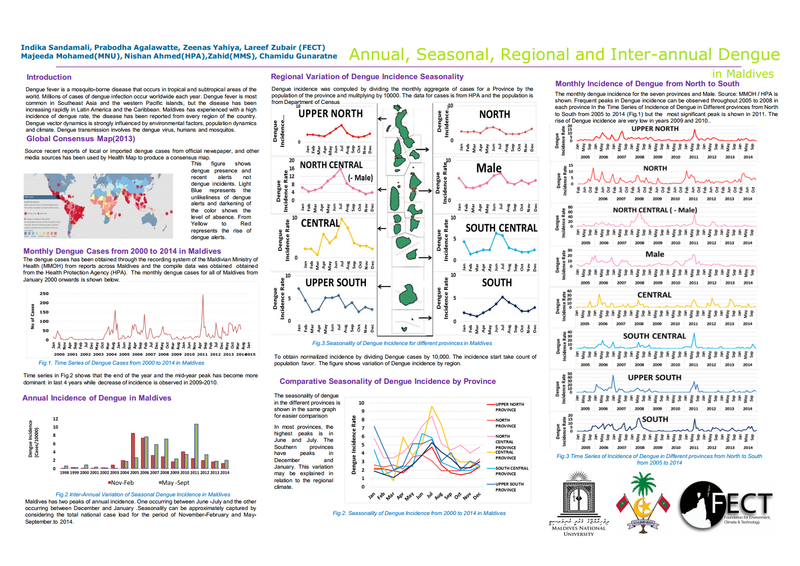 Annual, Seasonal, Regional and inter-annual dengue in Maldives. 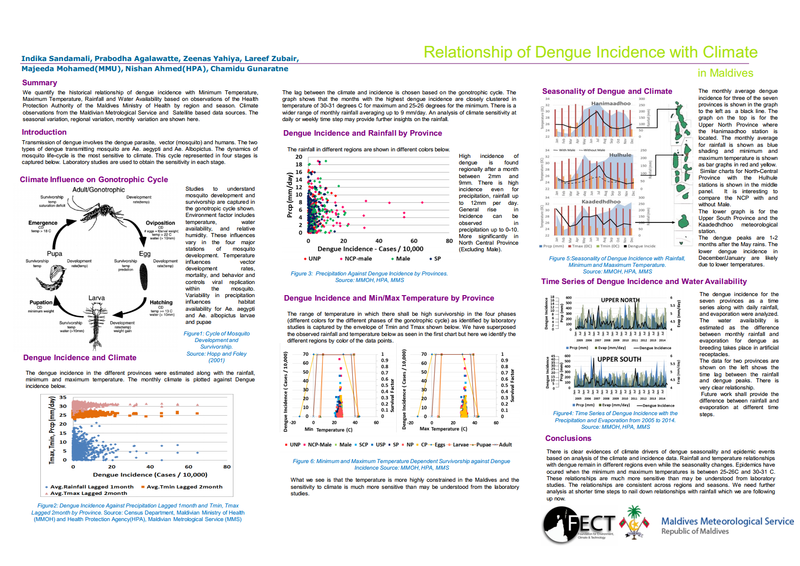 Relationship of dengue incidence with climate in Maldives. 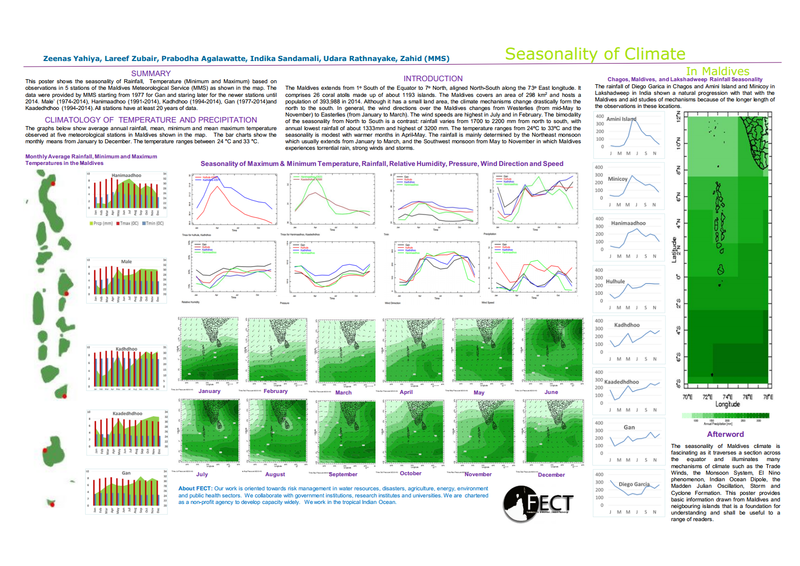 Seasonality of climate in Maldives. 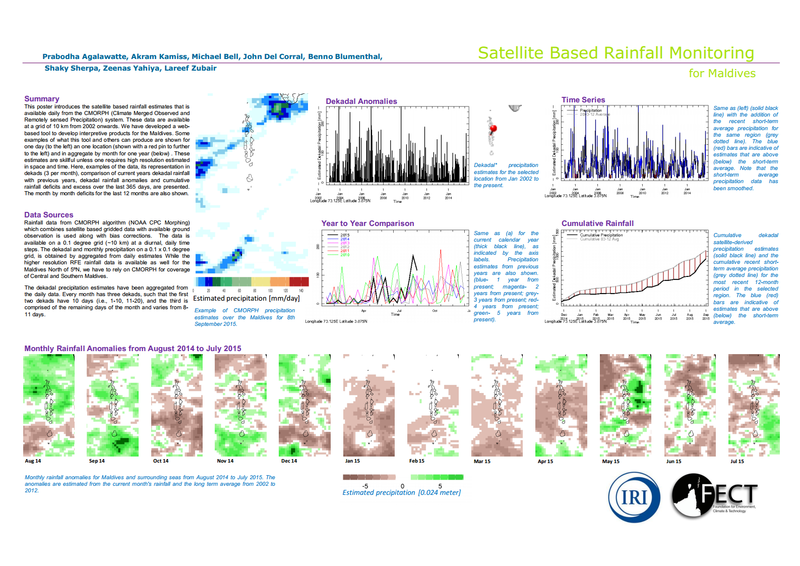 Satellite based rainfall monitoring for Maldives. Meteorology and predictability of tropical storm ARB-04in the indian ocean during November 2011. 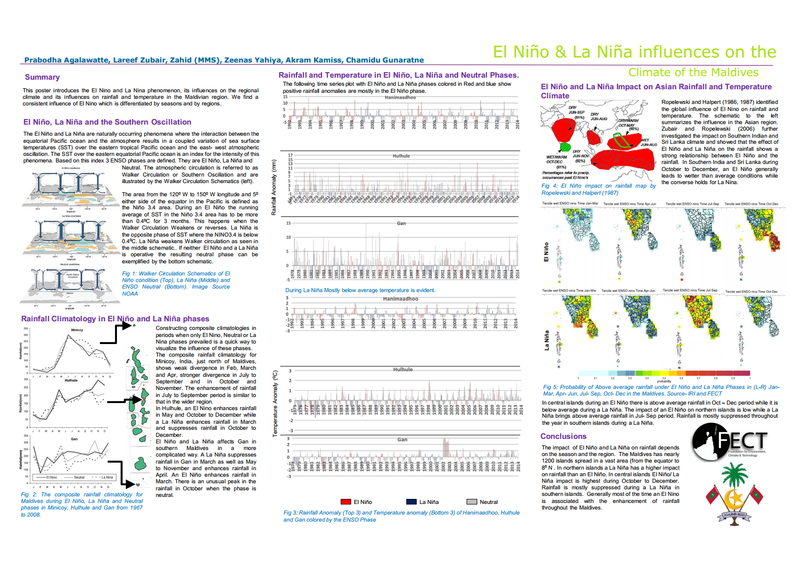 El Nino & La Nina influences on the climate of the Maldives. 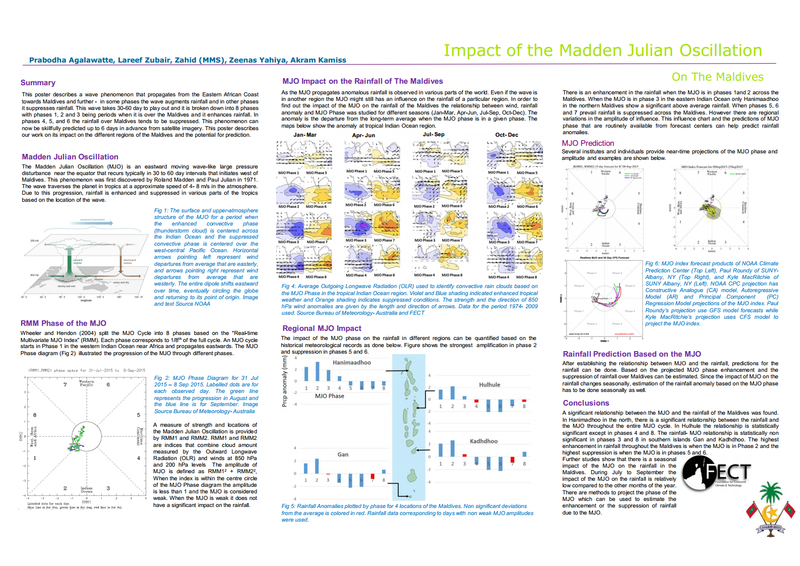 Impact of the Madden-Julian Oscillation on the Maldives. 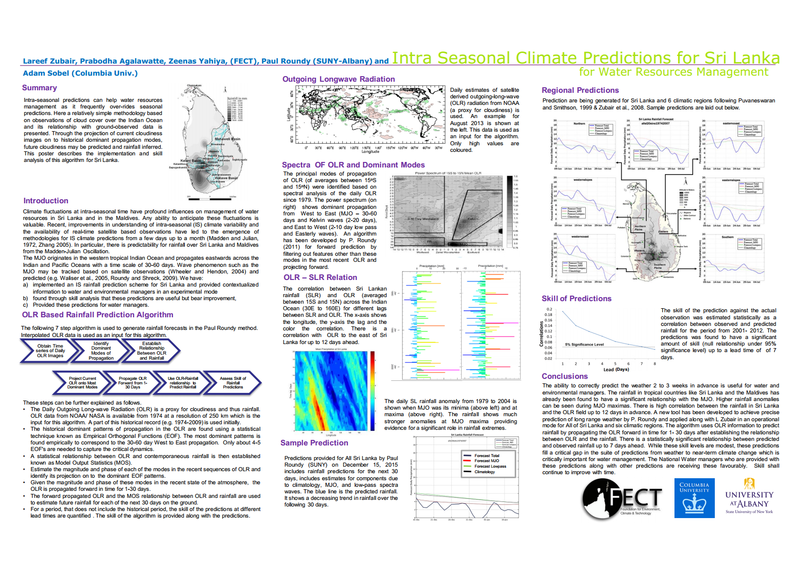 Intra seasonal climate predictions for Sri Lanka for water resources management. 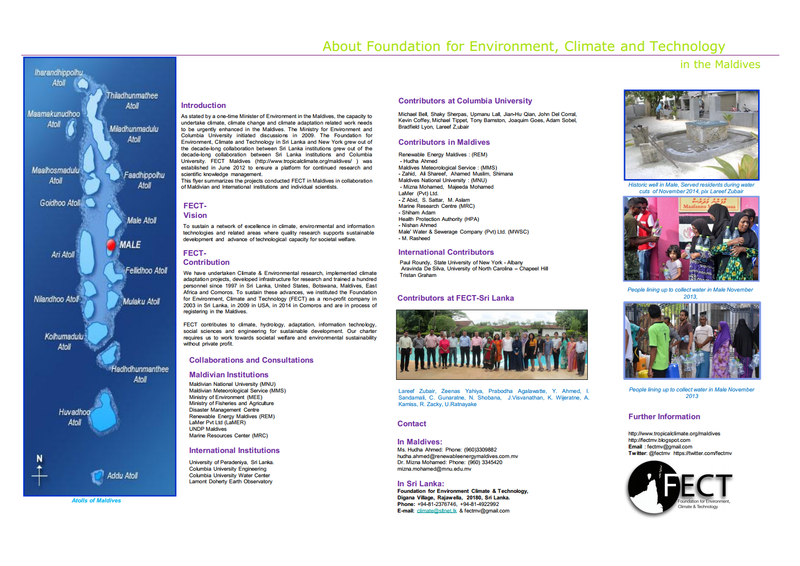 About Foundation for Environment, Climate and Technology in the Maldives. Video links of the speakers presentations in the climate and water workshop. A Video interview of Engineer Mohamed Rasheed on Developing Water supply and sewerage systems in the Maldives. Engineer Rasheed has dedicated his career to the issues of water supply and sewerage in the Maldives ever since he completed his post graduate education. He recently retired after 35 years of service at the Male Water Supply and Sewerage Company and its precursors. As such he has been involved in various phases in the development of water resources and sewerage across the Maldives. Back in 2012, just before there was a week of water failure in Male, he took time to distill his thoughts for the benefit of the younger generation. Together expertise on climate and water. To review the state of knowledge, and to identify research priorities and educational needs. 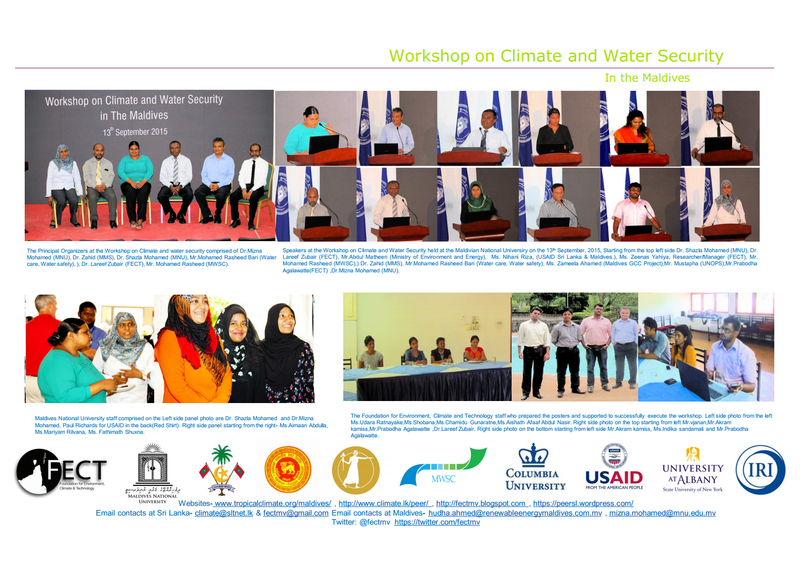 The presentations focused on sustainability of water resource management, climate and water resources linkages, climate monitoring and predictions for water management, the Climate Advisory for Maldives, and lessons learned from ongoing programmes and projects. Mohamed Rasheed (Male’ Water and Sewerage Company): Provided a fascinating review of water resources management programs in the Maldives over the last 40 years. Zahid (Maldives Meteorological Services): Provided a comprehensive review of climate analysis for Maldives as needed for water resources management. Mohamed Rasheed Bari (Water Care) reviewed successes and failures of past projects on Water Resources Management. 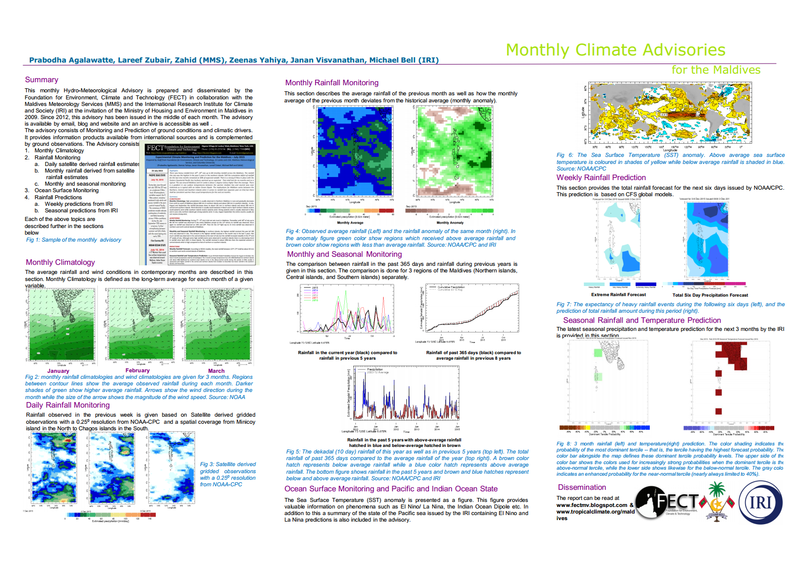 Prabodha Agalawatte (FECT): The Monthly Climate Advisory from FECT/MMS/IRI: Monitoring Weather and Climate for Maldives. 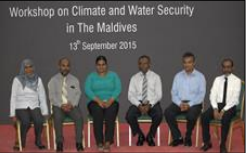 Lareef Zubair (FECT): Climate Science for the Maldives in Relation to Water Scarcity. Zameela Ahmed of Chemonics International and Mr. Mustapha from UNOPS: described the lessons learn from the ongoing projects funded by the USAID, on Enhancing Climate and water resiliency in Maldives. 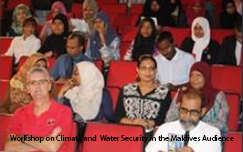 Mizna Mohamed briefly reviewed the ongoing work and the goals of the Maldives National University in regards to Climate and Water Resources. The turnout of the workshop was around 75 participants. Among the attendees were participants from Ministry of Environment, Maldivian Red Crescent, Maldives National Disaster Management Center, UNDP Maldives, Ministry of Health, CDE consulting, IUCN, Marine Research Centre, FENAKA Corporation, LaMER, Water Solution, USAID, Blue Peace, Renewable Energy, Students from University and Secondary Schools. The workshop ended with a panel discussion moderated by Dr. Mizna (MNU) followed by questions from the participants. The panel consisted of Mr. Mohamed Rasheed, Dr. Lareef Zubair, Dr. Zahid, Mr. Rasheed Bari, and Mr. Mohamed Mustapha of Environment Protection Agency, Ministry of Environment and Energy. The topics that arose during discussion were aspects of water resources planning in the Maldives, the desirability of use of plastic bottled water, and the relative role of climate, infrastructure and practices in managing water resources to meet present and future needs of people.